Riot Games teased a new playable character for League of Legends today. 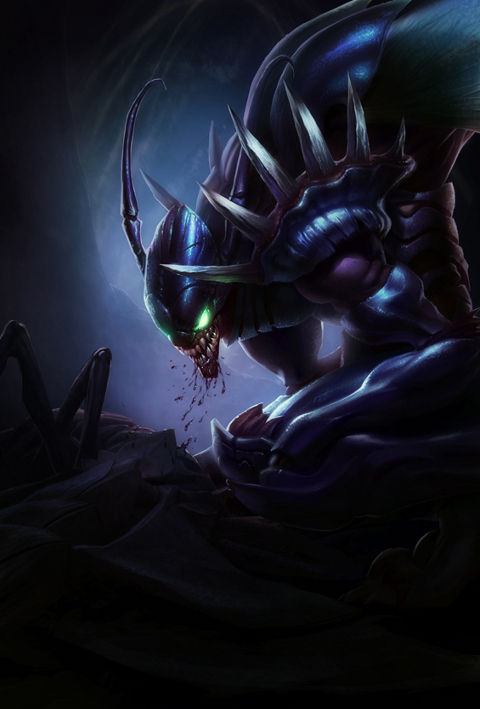 Kha'Zix the Voidreaver seems like the perfect Champion for players who value physical intimidation. Kha'Zix is said to be the "most highly-evolved champion yet." This creature's body changes as the match proceeds. Players can specify which evolutions to take. Options include adaptive camouflage and scythe-like claws. This creature's various evolutions should make him a very versatile Champion. More importantly, he looks amazing. Reminds me a bit of the creatures from Aliens. He'll unseat Skarner as the creepiest Champion around. There's no mention of when Kha'Zix will be playable. He'll be the 104th Champion available in the action strategy game.